It was now time to prepare the zippers. 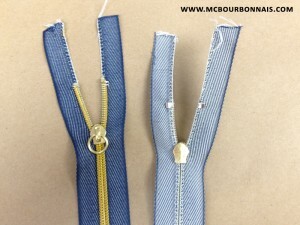 There are many types of zippers that I would put in 3 categories: nylon coil, plastic molded and metal zippers. The nylon coil looks like a ‘spiral’ that is sewn on to the zipper tape. It’s a very resistant zipper. 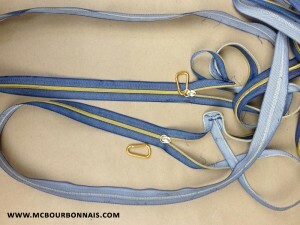 Invisible zippers are like ‘reverse coil’ zippers. The zipper itself is hidden under the tape, so when you sew an invisible zipper, the zipper from outside looks like a seamline. It’s mainly used for women clothing like dresses and skirts. Invisible zippers are, however, very fragile. Many years ago, when I was working as a seamstress in a sewing workshop where we were doing alterations, I changed a lot of invisible zippers in skirts that were probably too small for the clients who had purchased them. ;) Then you have plastic molded zippers. They are made of symetrical little molded plasic ‘teeth.’ That type of zipper tends to form ‘waves’ when you sew it, for example, in front of a jacket or hoodie. 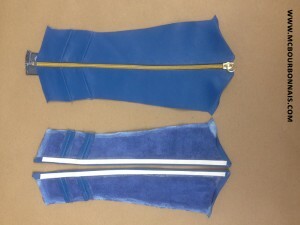 For a colored leather jacket for which you’d like to use a colored zipper, it would be better to go for a coil zipper. Plus, molded zippers are easy to break over the time. When one teeth breaks, your zipper is done. There’s no way to fix it. Finally, there are metal zippers. They come in various finishes like brass, antique brass, nickel, antique nickel, gun metal. 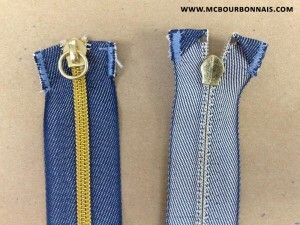 Metal zippers are commonly used for jeans. Look at a pair of jeans you have. The zipper is a metal one. Since the golden zippers are visible in Conner’s gloves design, I had to find a golden zipper with a blue tape, because the zipper’s fabric tape shows off on the side of the coil or theet when you sew it. Metal golden zippers exist, but they are commonly sold in very basic tape colors like black, white, beige, navy blue. No Power Girl blue tape zipper with golden teeth. 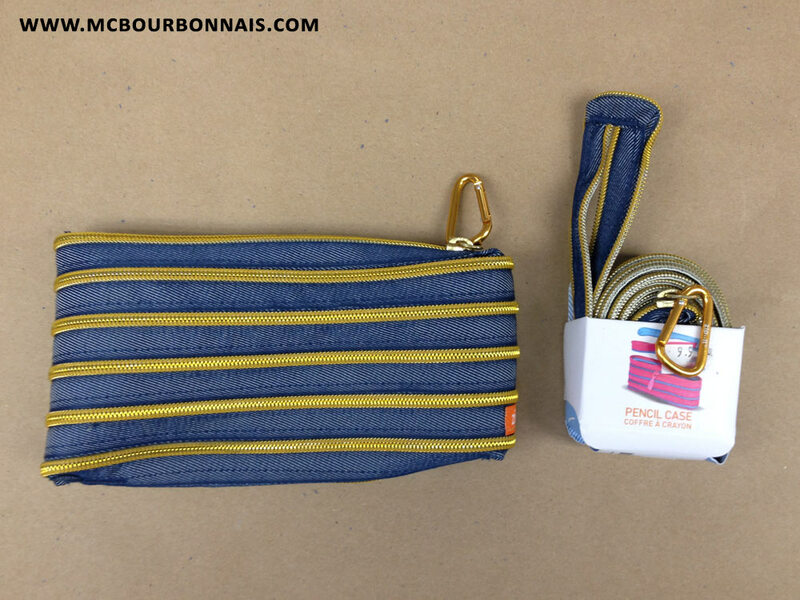 And then, I found a little treasure, certainly a sign from the God of Cosplay who put on my way these pencil cases made of a very long, custom golden coil zipper on a blue tape. If that isn’t a sign, I’m asking you, what is it? These pencil cases were yelling at me: ‘Buy me! I’m meant to be part of your Power Girl costume!’ At $10 each pencil case, yes, they turned out to become $10 zippers… But when you need it, you need it. Next step was to unsew the pencil cases to have one single zipper ready to be sewed. But since the zippers were so long, I had to cut them before sewing them to the gloves, which means that I had to add new little stoppers. 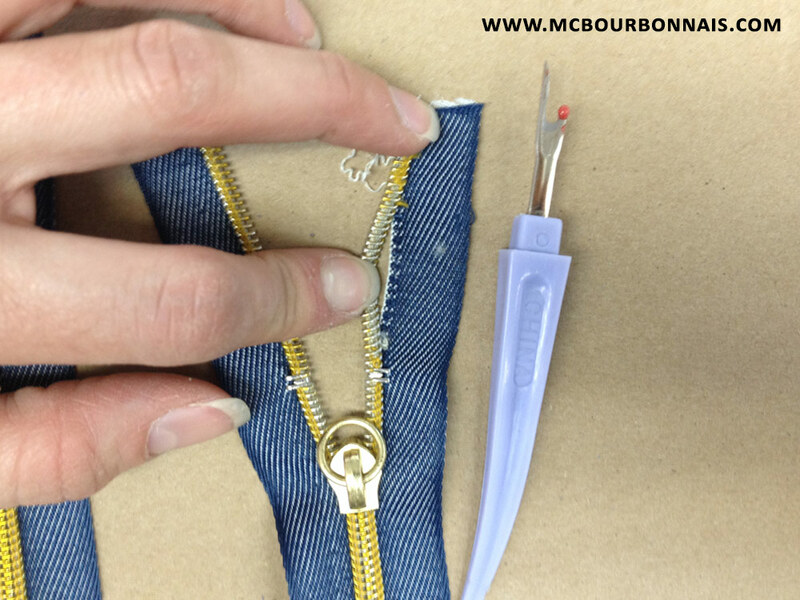 It’s easy to cut a zipper from the top or from the bottom when it’s not a separated zipper. In any case, you’ll have to add the appropriated stoppers. Coil, plastic molded and metal zippers need various stoppers. 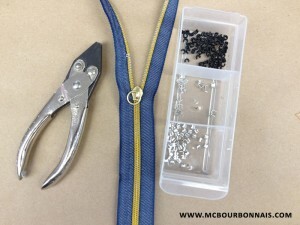 Since these golden zippers were coil zippers, I used these stoppers that you have to insert between 2 ‘teeth’ of the ‘spiral.’ Then you flatten down the stopper with pliers. 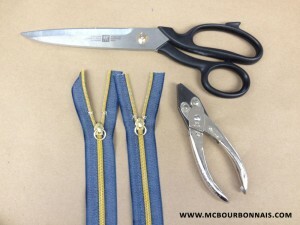 Preparing both zippers and cutting them to the correct length for the gloves. 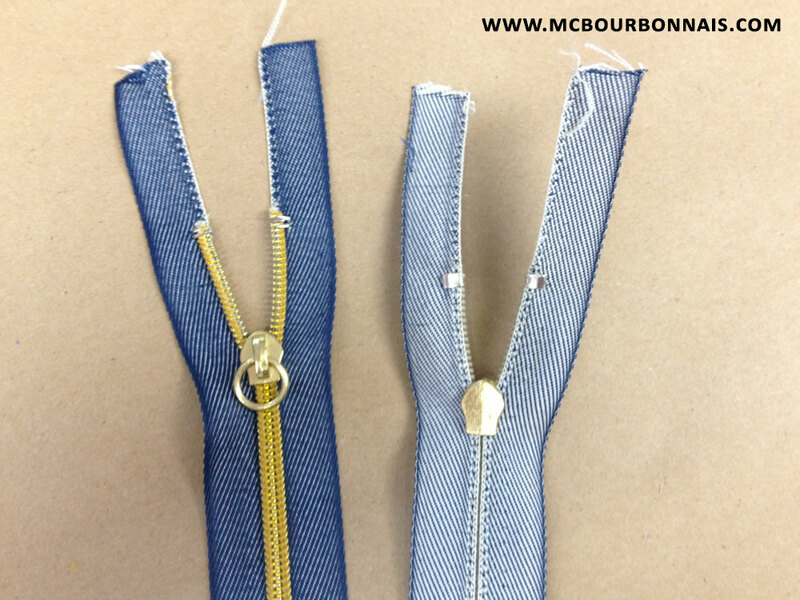 In order to make a nice finish when you sew your zipper, you have to get rid of the extra teeth or coil. 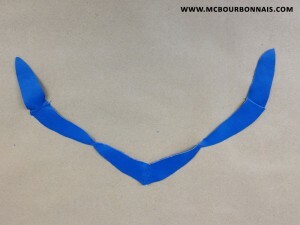 In this case, the coil is stitched to the tape, so you simply have to unsew it. The zippers with the extra part of the coil unsewed. Notice how the fabric tape remains intact. There are various way to sew the top part of the zipper tape before sewing the zipper. It can also be done directly when you sew the zipper to the garment. 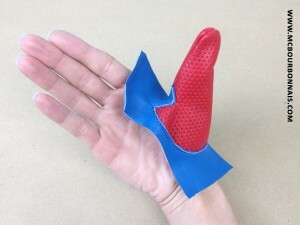 The seamstress or tailor will have enough skills to hold the tape with her or his fingers while sewing it. Since I can take my time and I want to do a very clean job, I choose to tack the zippers’ tape first. Since you can’t use pins in leather (because they leave holes), the most amazing trick I can give you to hold leather pieces in place is to use double sided tape. You can use it before sewing hems, zippers and so much more. 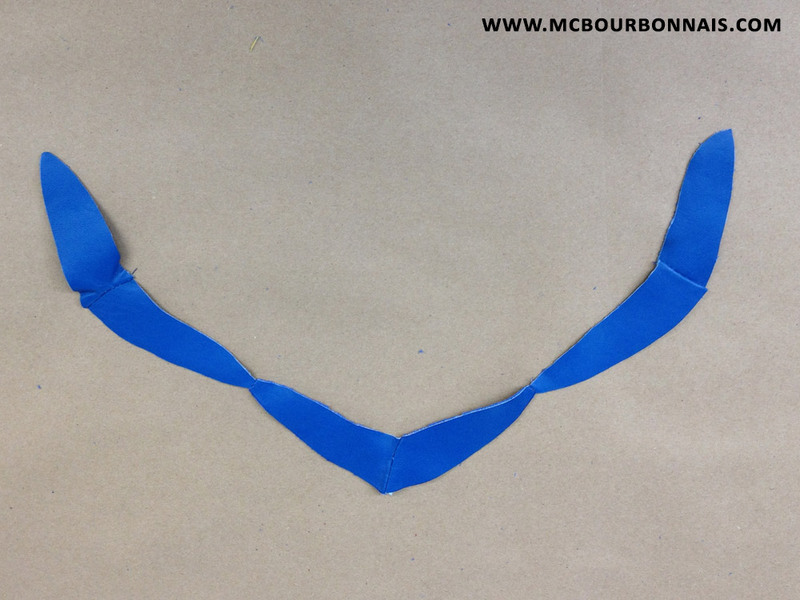 Using double sided tape was one of the tips that the teacher gave me when she went to my workshop and it allowed me to sew things that I couldn’t have made otherway. If you plan to sew leather, always have double sided tape next to you. It’s so handy. On the picture, you can see that I used stripes of double sided tape to apply the leather pieces on the zipper before sewing it with a top stitch. Work in progress picture of the gloves with the zippers, assembling more and more pieces together. One of the many prototypes I had to make before I suceeded in sewing that strange piece of pattern in the hole to form a thumb. Very tricky stitches that have to be done in a particular order. Strange step that looks like nothing: sewing together the tips of the small pieces that go between each finger. 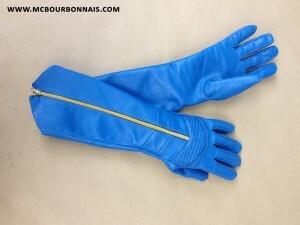 That stripe will be sewed all over the fingers, which is, in my opinion, the most complicated step in the whole process of sewing that precise glove pattern. On the next picture, I put my hand in the glove to show better which parts were sewn together. That’s the part inside the hand and arm. Now I had to sew the top part of the glove. Same challenge, going around those little pieces that go between each finger. That step requires a lot of precision. Otherway, the fingers will be unheaven or may ‘turn’ or ‘twist.’ There’s a lot that can go wrong in that step. That’s what I found the most difficult to do. 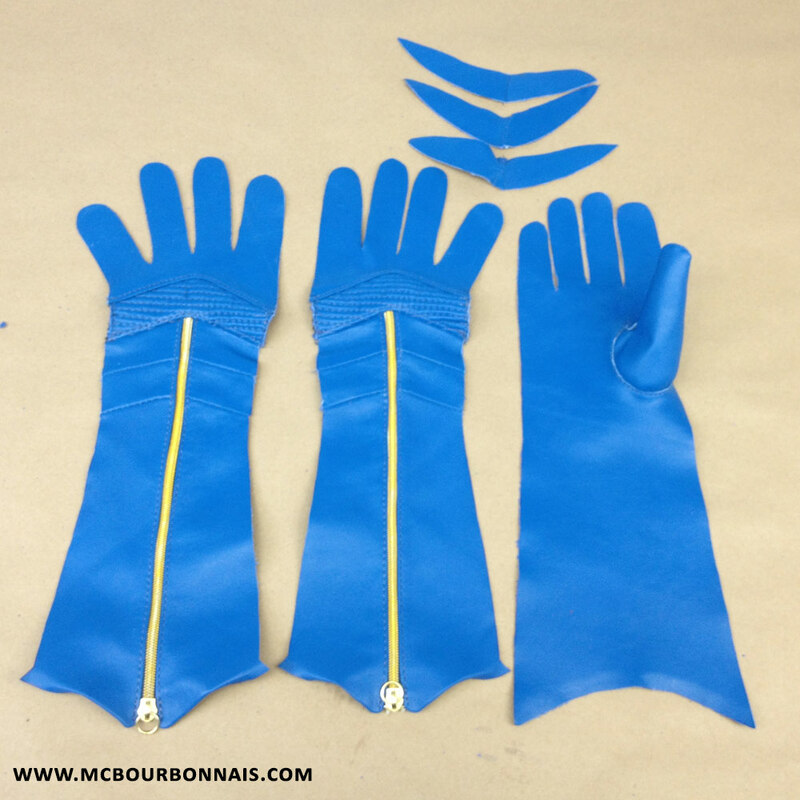 All the pieces of the gloves are now assembled. At the beginning, I mentioned that this blue cow hide had the perfect thickness to make boots, but that it was too thick to make delicate women’s gloves. Notice how the fingers have a bulky look. Lambskin would have given a more delicate result. 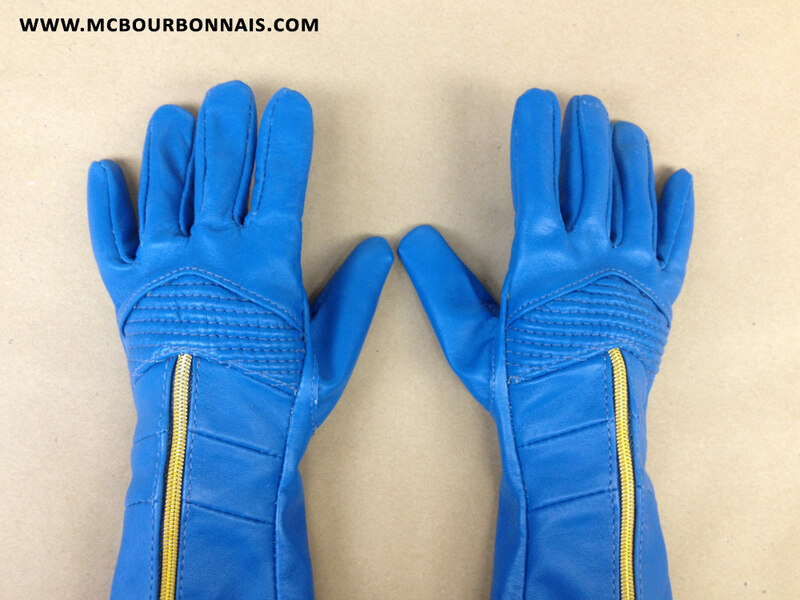 Did you use a pattern for the gloves? Your way ᧐f describing everything in this post is really good, all can effortlessly know it. Thanks a lot. On top of everything else I’ve said it becomes apparent to me that you would also make a first-class teacher. Thanks for the blog, Marie-Claude! That’s some very interesting info about zippers, never thought about it before. It’s pretty cool how talent and good luck helped create an excellent piece of costume. 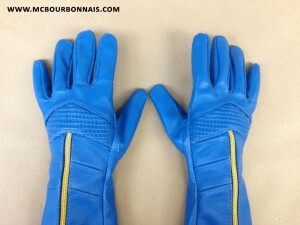 It’s pretty awesome how you matched all of the little details from the Connor’s version of the gloves. Great work! The level of craftsmanship, quality, and detail that Marie-Claude brings to the costumes she creates is incredible! These are custom, handmade costumes. Not off-the-rack. Costumes for major Hollywood films don’t have this amount of detail. Marie-Claude Bourbonnais is a true artist in every sense of the word! Bravo, MC!! Very cool, now those gloves look like something a real super hero would use. I guess that is kinda the point. It must be inspirational to amateur cosplayers that a pro like your self will re-purpose things like the pencil cases to get the materials that work for you. Thank you for posting this blog! I’ve been following you for a while and I love your attention to detail. I’ve been dabbling with leather working for a few years now, mostly on pouches and belts. 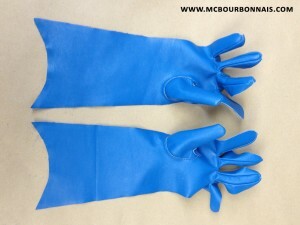 I want to make gloves someday, but have been hesitant because of how daunting they seam. I love your pictures and explanation of how you made them. They don’t seem so difficult now, after reading your blog.